Backup generators are your personal solution for short-term energy independence, making home life livable until your power can be restored. But generators come in a range of types, sizes and costs, so you’ll want to put a fair amount of thought into this high-involvement purchase. As you compile your list of essential appliances, you’ll need to note the wattage of each. Owner’s manuals are great sources for this information. If you’re willing to take an estimate, you can use the Department of Energy’s appliance energy calculator. And if you want the most accurate count possible, we can send an electrician to conduct load measurements of every appliance on your list. 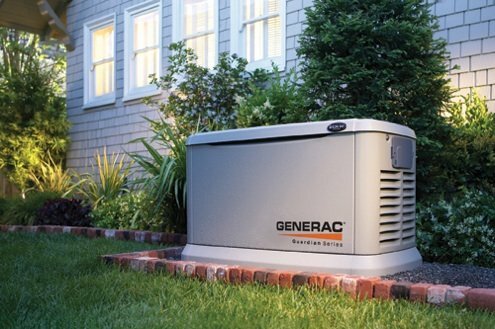 Standby generators are what you choose when you don’t even want to know that a power outage is occurring. Stationary and hardwired into your electrical panel, these generators activate automatically when power is interrupted and are designed to keep an entire home running, including the HVAC system. They require professional installation and either a natural gas or liquid propane fuel source. Total costs vary by generator size and ease of installation. Portable generators cost can vary depending on size and features. These can be wheeled around your property, where they’ll need to be set up at least 20 feet away from your home for safety. Smaller portable generators may be enough for a fridge and a few electronics, but larger ones can compete for capacity with mid-range standby generators. These run on liquid propane or gasoline, which can be in short supply during long power outages. A transfer switch is a unit that attaches to your home’s electrical panel and allows you to connect a generator to your home with a single cable. It’s safer and more reliable than using individual extension cords. Transfer switches are commonly included with standby generators, but rarely included with portable or inverter generators. Be sure to carefully read the list of all components included with any generator you’re thinking about buying, and price a transfer switch separately if it’s not part of the package. For routine maintenance to professional installation of transfer switches and standby systems, your backup generator will be most reliable under the care of a licensed, knowledgeable electrician. Once you have decided on the generator of your dreams give us a call and schedule an appointment with one of our professional electricians today!